Heart Society began as the solo work of Alicia Teneia Sanders-Eichelberger. A performer her whole life, Sanders-Eichelberger got her start singing in churches and school choirs while growing up in Jackson, MS. After learning guitar at eighteen and playing venues around Jackson, she made a move to Louisville, KY and pursued a full-time career in musical performance. She became popular in the Louisville scene for her angelic voice and raw, honest songwriting, and also enjoyed success with her band Teneia Sanders & The Highlands. In 2010 Sanders-Eichelberger relocated to Phoenix, AZ, and continued to build her name as a standout acoustic singer/songwriter. In 2012 she met her future husband, Benjamin Eichelberger, and in 2014 they started a band called Teneia & The Maybees. By 2015 the couple had adopted a duo format under the name Teneia, and decided to take their music on the road full-time to spread a message of love and equality. After completing a successful crowdfunding campaign, the two took a huge leap of faith: they sold most of their possessions and bought a 32-foot travel trailer to tour North America and reach more hearts with their message. The duo became Heart Society in 2017, and has continued to write and perform original music for loving audiences across the United States and Canada. 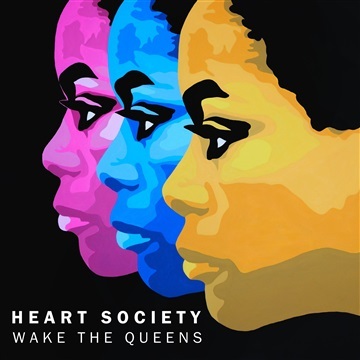 Heart Society's groove-based blend of rock, soul, blues, and folk music will make you want to get out of your seat and dance, while their inspiring message of love and equality will stir your heart. The band’s debut EP Wake the Queens centers around female empowerment and unapologetic authenticity, and is an invitation for every listener to shed convention and become a powerful force for good in the world.